I swear, these rakghoul event posts pretty much write themselves. Stuff just keeps happening. I think that's why I've been loving this event so much - not because it gave us another set of dailies similar to ones that have come before, but because it draws people together and encourages them to write their own stories. With everyone fighting for resources, against big monsters or against each other, it's hard not to be faced with interesting decisions and make new discoveries. I think it would be stressful if the game was like that all the time, but just for a week? Awesome. In terms of Eyeless achievements, I got to tick off the last one by getting a 16-person hardmode run under my belt. Unlike the 8-person version, this one actually felt quite hard too. You still seem to have seemingly endless amounts of time (which we once again needed due to several people dying), but our very well geared tank took quite a beating. As Ernost also observed, after the boss jumps into the air he likes to pound on the tank like nobody's business, and both the tank and the healers better be ready to use some cooldowns at that point. 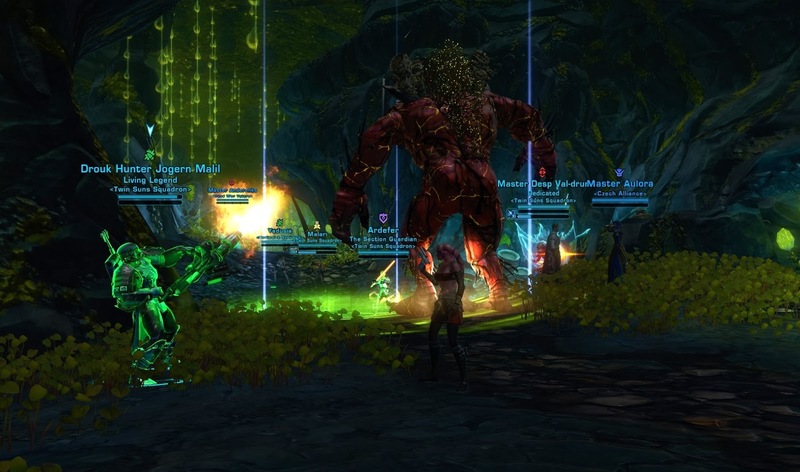 Our own tank died shortly before the boss did, but fortunately we had a spare tank in the raid who could pick him up for the last couple of percentage points. I also got to kill Shellshock in a pug group. I had only just arrived on Alderaan when I saw the call for a healer go out in general chat, so I thought: why not? He wasn't too hard, though that AoE that regularly removes your vaccine is quite annoying (and expensive, assuming you want to actually do something instead of spending the rest of the fight getting stunned every couple of seconds). 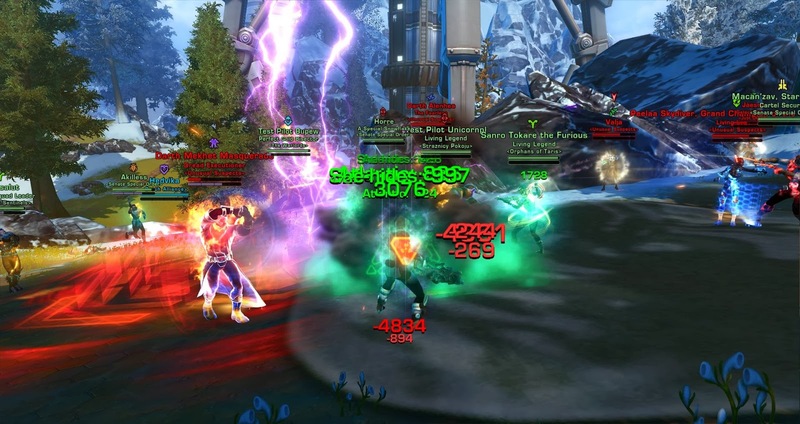 We then switched instances to kill him again, but as we were doing so a couple of Imps showed up and several people in our ops group were PvP flagged... so the Imps had no trouble wiping us, especially with the boss stunning the entire group so frequently. Since we outnumbered them, we probably could have rallied and killed them in return, but people hadn't really joined the group to PvP and preferred to leave and do something else. I ran into the Tunnel Lurker a couple more times. Once I was on my own on my gunslinger and immediately shot him out of some sort of "rare, must tag" kind of reflex, though that just led to me dying very quickly. Another time I saw someone else engaging him and joined in just because I could, even knowing that I wouldn't get anything for the kill. This guy is kind of tough to plan around, since he's strong enough that you need a group but also wanders around a lot, so you can't exactly spawn-camp him with your friends. You kind of need to be lucky and already be in a group when you happen to run into him. Fortunately that's exactly what happened to me and a guildie when we were running around doing dailies while an ops group was forming for another Eyeless run. As soon as I called out on TeamSpeak that the Lurker had spawned, everyone already in the group converged on my location and we killed him quickly and with no problems. We didn't get anything worthwhile from it, but it still felt good to get it done. Another interesting new kill I got was the "Midnight Rakghoul", a special new mini-boss that has been added to Kaon Under Siege. I love that Bioware added something like that to an older flashpoint. Never let old content go to waste if it fits your current theme, I say! He drops a guaranteed Midnight Rakling apparently, as opposed to the low random chance it always had of dropping in Lost Island HM. Speaking of guaranteed drops, I'm now up to three Pale Rakling drops from the random plague bearer spawns on Alderaan in House Organa or Thul. Don't evade them if there's an elite in the group, because so far they've always delivered some nice loot for me. My Marauder was also among the alts I decided to take to Alderaan, and as usual it was a pretty hilariously terrible experience. I had basically only just arrived when I spawned a group of 53 mobs (my level), and as I was in the process of killing them, some level 55 drove by, spawned more mobs and for some reason they all aggroed on me too. I died, so I had to buy more vaccines. I really feel for any lower level characters trying to participate in this. Then I noticed that I hadn't even trained my level 53 abilities, and when I summoned my Holo Hutt, I realised that I didn't actually have enough money to train. This is what happens when you leave a character on the fleet for months, doing nothing but run diplomacy missions to change her alignment, but don't do anything that could actually earn her money. Oops. After a couple more deaths, I did eventually make it through all the dailies, which gave me enough cash to buy all my training and also dinged me to 54. If you're feeling in a funk on any of your alts and are enjoying the event, it's definitely a good opportunity to earn some XP while doing something slightly different. I finally got in a 16-man Eyeless run last night. It wasn't hardmode, but considering I rarely get into Ops without dealing with a World Boss, it's a bit of an achievement. 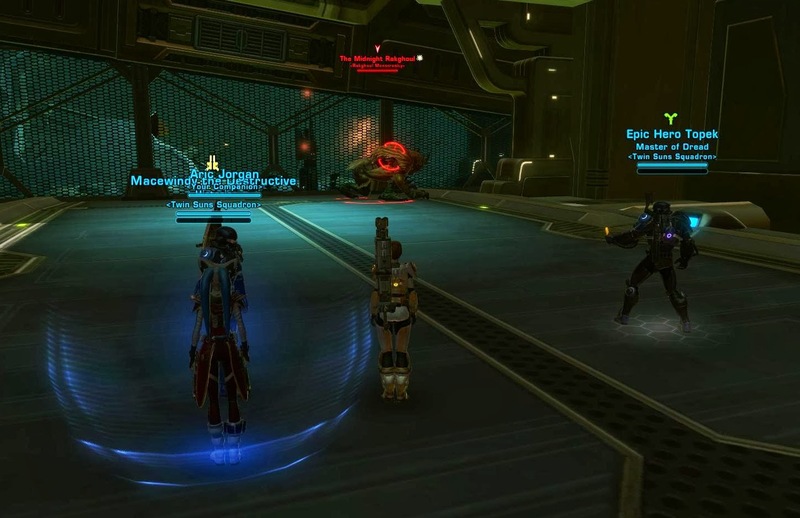 There's also the issue of me typically getting on SWTOR either too late or too early in the day for people to be getting Ops together, so it felt good to actually participate in one for a change. I've a short confession to make, tho: since I really didn't want any of the rollable drops, I didn't bother to make a roll for them. Me, I just wanted the satisfaction of downing that sucker.